Interesting to call this book a classic. It's not quite 30 years old, and arguably it's hopelessly outdated, focusing on television when we live in a worldwide web world. However, for years I heard it referenced by many other authors I admired, so I finally decided that it was "really good" enough to make a PowerPoint on for my fellow teachers. Why is it so good? To begin with, Postman goes even further back to that Canadian media maven, Marshall McLuhan, who coined the phrase "The medium is the message" to explain how every new technology carries with it new ideas about the structure of the world. For example, idols tell us (falsely) that the gods can be seen, clocks carry the message that we need not live by the rhythms of nature, and books imply communication with an unseen audience – as does electronic communication, though in a different way. As well as conveying different views of the world, different media value different ways of knowing and kinds of knowledge. For example, an oral culture uses proverbs and traditional wisdom to settle disputes, while a literate culture is not impressed by such sources, unless they are backed up by codified, written knowledge. Postman applies these general principles to American culture (and we can also apply it to Canada!). He demonstrates how Early America’s widespread literacy fostered a society that valued sustained argument, as proven by the widespread reading of serious books, the greater number of newspapers per capita in America than in the British nation that founded the colonies, and the frequent attendance by the 'masses' of lectures and services with complex sermons. Postman calls this period in America the Age of Exposition, in which large crowds attended debates by Lincoln and Douglas with each speaking for an hour at a time, lawyers were considered heroes rather than villains for their logical skill, and even advertisements emphasized arguments over images. The turn away from exposition resulted from three new technologies giving Americans access to what he calls decontextualized information: telegraph news services that allowed people to follow news that had no local significance to them; photography, which allowed people direct visual experience of a remote setting without exposition or description; and television, which turned knowledge into entertainment. Postman looks particularly at how television's emphasis on entertainment has distorted various realms of American life. 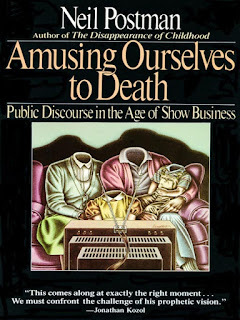 In politics, the 1984 television presidential debate was won in the court of public opinion by the candidate with the best one-liners, and the emphasis on current trends has ended the use of intelligent historical argument. In news coverage, the phrase "Now... this" alerts viewers to the fact that we are leaving one 90-second item for the next unrelated item, the visual appearance of news anchors may get them hired or fired, and many rely on USA Today and People for the equivalent of TV news coverage. Even religion is dominated by televangelism and megachurches inspired by their approach to worship that requires nothing of the worshiper, particularly no real communion of saints. In education, the use of television [and Youtube videos?] has led to experiences for students that give little context and exposition and ask for little effort. Postman ends by warning that the scenario of Aldous Huxley's Brave New World, in which the public is kept sedated by soma (an appealing drug) is analogous to television's pop culture sedation of our minds today, and far more likely than George Orwell's oppressive Big Brother world of 1984. In many ways, I think we live in a world that has generous dollops of both, in which Hollywood, "epic fail" videos on Youtube, and the NSA combine to keep the public under watch and uninterested. How we got here, Postman tells us. How it applies to today's world, and what we can do about it, is something thoughtful Christians will begin to ponder when they see how technology, so powerful in the good it can do (e.g. lifesitenews.com, creation.com, arpacanada.ca, etc. 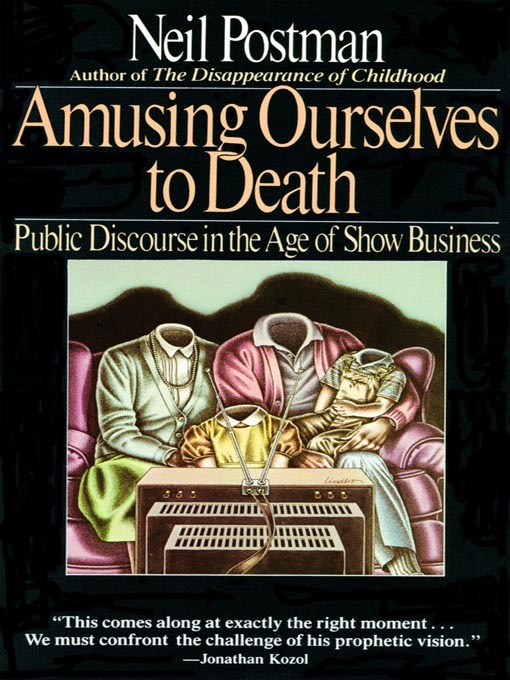 ), can also end up Amusing Ourselves to Death.